Are you attracted to growing cannabis at home for family medication? Or are you wondering how to start it? And what equipment do you need to possess for you to grow cannabis at home perfectly? All these questions are likely to be part of your confusion when you are a beginner at growing cannabis indoors. Growing cannabis in homes is of great help to you as a marijuana user. It keeps you off the burden of purchasing this medical plant at regular intervals. However, these benefits come with a huge task for you to do as a family. As a result, how to start and the responsibilities after that initializing the project can be discouraging. To help you on how to do this easily, we have prepared for you a guide on how to grow marijuana at home. The steps are simple and easy to learn and understand. Apart from clearing the space to do your planting, there are a lot of things you need to plan first. The planning helps you to come up with a strain that will perfectly grow in your area. It will also help figure out where you need to do the planting, as well as the types of equipment needed to prepare your garden. All this will be achieved if you have a perfect plan before you can start any physical work. Deciding on where to locate your garden is what you should do after coming up with a clear plan. The garden can be in a tent, house cabinet, empty rooms, a greenhouse or any space that you find suitable. All you need is a space that can perfectly accommodate your pieces of equipment. Space should be well organized for easy operations within the room. Selecting a growing space helps you determine the number of plants that you can grow without any pressure. #3. Which cannabis strain do you want to grow? It is possible that you will run and purchase a stain that you never did good research on its performance in your locality. Every type of plant has a brand that works perfectly in a certain environment. Before you can get into the business, research on how good a brand of your interest performs in your area. There are factors you should look out for when buying a strain that will perfectly grow in your environment. 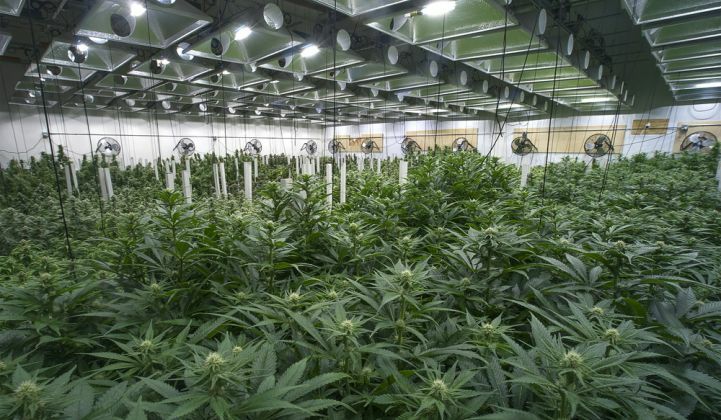 Size of the full-grown plant: by determining to what size the brand of your interest grows when mature, you will be able to identify the number of plants your grow room can accommodate. It also guides you in approximating the expected amount of yield. You also find it easy to understand how strong your lighting system will need to be. Quantity and Quality of the yields: determine what the yields of the brand look like. Strains with bigger buds need more lighting and nutrition. It is good to understand how much yields a specific brand produce. Consider buying a strain that gives you what you want to taste and experience. There are different mediums used to grow marijuana. Determining the medium of your interest determines the number of nutrients you are going to use on your plants.The preferable medium to grow your plants in is soil. It is considered the best as it already contains most of the nutrients needed. Soil also holds nutrients for a much longer period. Another choice you can use to grow marijuana in is the hydroponics. The medium is preferred as it is less messy and easy to mix with the nutrient supplements. Harvesting plants grown in hydroponics is much easier when compared to those in the soil. Lastly, we can use cocoa as our third option in which we can grow marijuana. The only advantage with it is the fact that you do not need heavy water flow as in case of hydroponics. It also retains nutrients longer than hydroponics can. If you are a beginner, it is recommended you use soil as your medium to grow marijuana in. Coco and hydroponics are meant to be used by growers in higher skill levels. Once you have decided on where to do the planting, the cannabis strain of your interest, and the medium for growing your brand, you need to be smart and start small. As a beginner, you are likely to make a lot of mistakes. These mistakes are very costly in most cases. When you plant a few plants, the number of mistakes you are likely to make will be very few. This will lower the cost of operation. Also, it will be easy to take care of few plants compared to when you start with a large number. Your lighting system is important when determining how much yields you are going to get. However, it is good you consider what will be the effects of the selected lighting system on your plants. There are different options that you can consider when selecting a lighting system. These include high-intensity discharge (HID) grow lights, the light emitting diode (LED) grow lights, and T5 Fluorescent Lights. With the HID grow lights, you can use either the metal halide lamp or the high-pressure sodium light lamps. HID grow lights offer your plants with the light closest to sun’s spectrum. It is for this reason that it results in a higher quantity yields. If you are quality driven rather than quantity driven, LED’s grow lights are the most recommendable. In this case, the yields have a better flavor, sticky and with better quality. LED lights also last for a longer period, with less consumption of energy. Heat production is also low, and hence, no much cooling will be required. With T5 grow lights, you are likely to have plants that are small in size. T5 lights are also considered easy to set as it comes in a single package consisting of the reflector, bulbs and the ballast. The main advantage with T5 grow lights over the other types of the lighting system is the fact that, there is no cooling system needed. This is so as they generate less amount of heat. Other grow lights include the induction Grow lights also referred to as electrodeless fluorescent lamps. Knowing which tools are needed to start the work and maintain your grow space in good condition is of paramount importance. Some of these tools are a must to have to all marijuana growers. These include a hygrometer for easy control of humidity levels in your grow room. For safe pruning, you need to be in possession of sheers. This will make sure that you rarely injure your plant when doing the pruning. A pH meter is also of great importance. You do not want to give your plants nutrients in excess or low amounts. To help you supply your plants with the right amount of nutrients, a pH meter will be needed. You will as well need a thermometer to make sure that you maintain the correct temperatures in your grow room. You need to keep your strains grow room as clean as possible. Use surfaces that are easy to clean. Avoid the use of carpets and drape surfaces as they can be hard to clean. Clean rooms maintain open stomata for absorption of CO2. Your plants need fresh air supply to absorb enough CO2 for photosynthesis. Make sure you install your grow room with proper ventilation system or an exhaust fan. Using a fan will be a great choice in expelling warm air out of the grow room. For high-quality cannabis, you need to maintain a constant supply of the required nutrients. The fertilizers used should be rich in nitrogen, phosphorus, and potassium. Other nutrients include calcium, iron, magnesium, and copper. Feed your plants with these nutrients at least once in a week. Growing marijuana at home is not an easy task. It calls for personal commitment and discipline. However, despite the many activities, the results are great. In case you are planning to do home-based marijuana growing, consider using the guide above. Doing this ensures that your plants grow under the right conditions, resulting in great overall yields and quality.